When Dr. Abio Ayeliya of Salt Lake Community College first moved to the United States, many people would give him the thumbs-up sign to let him know when he was doing a good job at something. In Ghana, where Ayeliya is from, the thumbs-up sign is the equivalent of the United States middle finger. Rather than taking offense at the gesture, Ayeliya went home and asked his roommate what it meant. 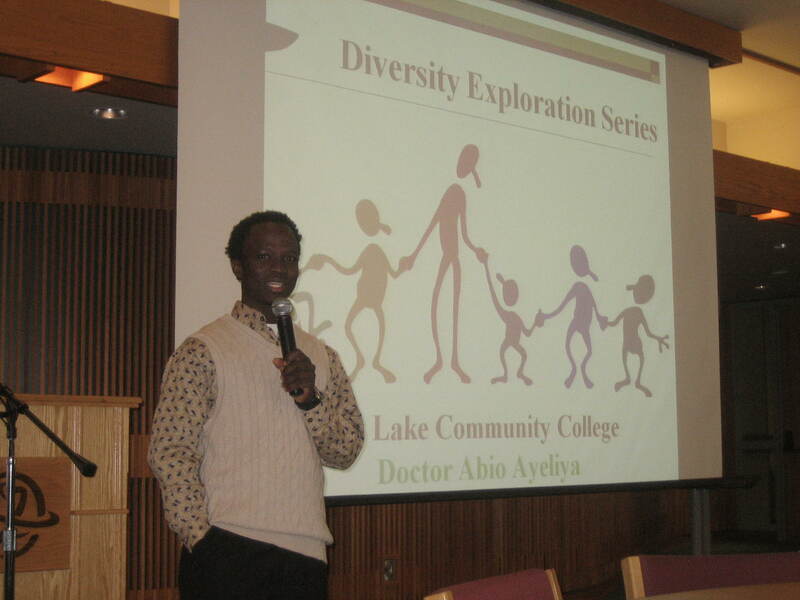 Ayeliya kicked off the Diversity Exploration Series at SLCC with a discussion on October 20, 2011 in the Oak Room on the Taylorsville Redwood Campus. Ayeliya explored the idea of diversity and why it is important to learn about it. About 50 people were in attendance. “The best education is not only in books,” said Ayeliya. It “is when you are reading a book and you have someone to argue with” (about what is in the book). Diversity doesn’t just equate to skin color. It includes backgrounds, religious beliefs, age, gender, disability, sexual orientation and national origin. SLCC’s minority population is about 17 percent with another 10 percent who did not identify their race. This is the largest population of minorities for higher education institutions in the state of Utah. The average age of a student at SLCC is about 26 years old. Ayeliya said that learning about diversity helps “improve knowledge of how to operate in different cultures.” It also “promotes personal growth and a healthy society,” he said. Creating stronger communities and workplaces, increasing economic competitiveness and promoting peace and harmony were other reasons Ayeliya gave to learn about diversity. To increase knowledge about diversity, Ayeliya said that people should get to know their neighbors, know themselves and treat others as they want to be treated. “Human beings are ethnocentric,” said Ayeliya. They tend to think that their way is the best way. This creates a barrier to creating a more diverse social network. Other barriers include the fact that it is difficult for people to share power, there is comfort and trust in likeness and people resist change. There are four key words for developing diversity competence: knowledge, awareness, skills and actionable behavior. By learning about other cultures through books, movies or other experiences, people can increase their knowledge. Awareness allows people to “recognize our differences as diversity rather than abnormal behavior,” he said. Skills to develop include the ability to communicate across cultures, problem solving and conflict management. Once learned, these skills can be taught to others and become actionable behaviors. Showing patience when working with others is an important actionable skill. Ayeliya used a portion of the video “A Peacock in the Land of Penguins” to illustrate various points. The animated video is about a peacock who is hired by a company of penguins because they like the peacock’s creativity. Once on the job, the penguins ask the peacock to wear a penguin suit. The next discussion in the series on November 17, 2011 will feature the Inclusion Center leading a discussion on the LGBTQ community and how to better unite and understand it. A dinner is scheduled for March 8, 2012 where topics and questions will be discussed at the table.